← The Valkyrie Project is free on Amazon! Before I instruct on the surprisingly simple art of acquiring audiobooks in a remarkably monetarily efficient manner, let’s get 2 things out of the way. 1. This post presupposes that you don’t need to purchase a particular book at a specific time (e.g., as soon as it comes out). For example, I have 700+ books on my To Read least in Goodreads, so reading a new book by an author (even one that I really like), is not something that I generally do. I actually plan the books I’m going to read a year in advance (call this obsessive if you like, but I do allow myself to deviate from that plan. I just like to have goals and I’m a slow reader, so if it’s important to me to read a book, then I want to make sure I get to it). Okay, so if you can also wait patiently for a Twitter or Facebook or email announcement that an author or their publisher has discounted one of their books, then you’re halfway there. 2. The second prerequisite is that you prefer audiobooks to the exclusion of almost anything else. For me, this is more out of necessity than anything else. If I’m going to sit down with my iPad or my Kindle Paperwhite (or any other eReader), it’s almost certainly because I’ve got a technical or programming book that I need to (and sometimes even want to!) get through. So in order to “read” fiction books, I have to make use of times when I’m cleaning the floors, or weeding, or mowing the lawn, or even just walking to work. Okay, so, given that you’re still reading, or skipped over that part to get to the goods… It’s really quite simple. 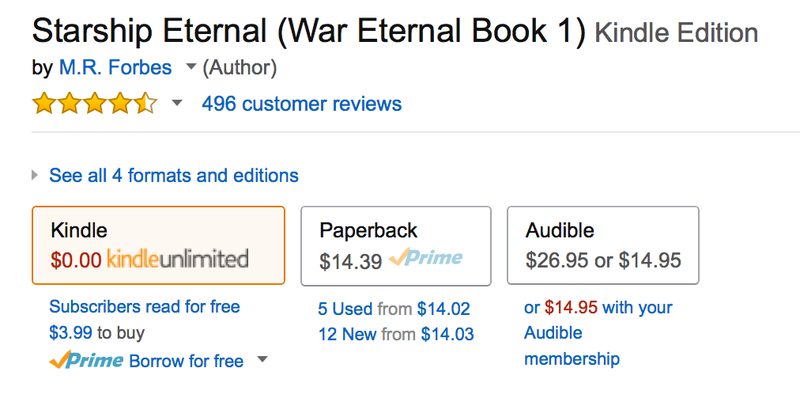 But the audiobook version is $26.95 (or $14.95 if you subscribe to Audible). That’s a big difference. 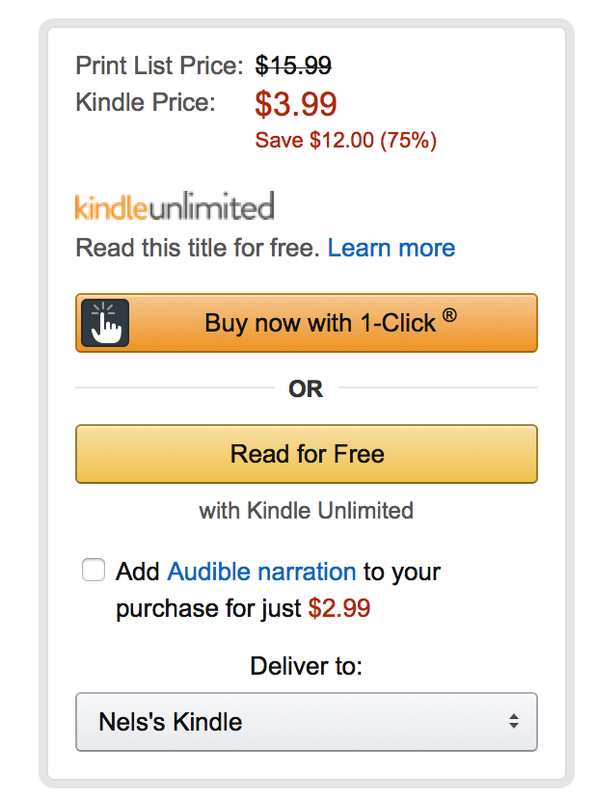 Wait – does that really say “Add Audible Narration for $2.99” when you buy the Kindle edition? And $3.99 + $2.99 is much less than $26.95. Less than $14.95 too. In fact, it’s more than 55% off the Audible subscriber price! And that’s really all there is to it. I’ve done it for 10 different books now and the only consequence is that I’ve got a lot of great audiobooks to read. You can get The Winds of Khalakovo for $2.98 vs $29.95 for the Audible edition by itself. And just to clarify, this isn’t just for author’s who are offering these books themselves (independently published). I’ve bought Perdido Street Station, Blackbirds, and No Return like this. If you go check right now, all of those are a lot more expensive, but since we’ve already assumed that you don’t need to buy one of them right now, you can wait until the author or publisher decides to throw a discount your way and then go take shameless advantage. Posted on May 30, 2015, in Amazon, Blog, Books, Personal Finance and tagged Amazon, Audible, Audiobooks, Kindle. Bookmark the permalink. Comments Off on The Cheapskate’s Guide to Acquiring Audiobooks.